How are the icons for each Stack Exchange community chosen? I noticed some communities have their own icon (logo) while other just have a generic one with the first letter of the community. Coffee and 3D Printing communities have a generic logo at the moment. 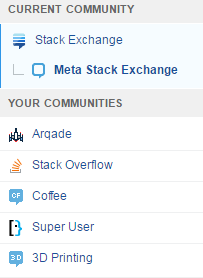 Can someone explain how icons for each Stack Exchange community are chosen? The blue ones with white text (occasionally another grapheme but usually text) are beta sites. Nearly all beta sites use the same site style. Coffee and 3D Printing are beta sites. When a site graduates, one of the designers on staff will work with input from the community to develop a complete custom design for that site, including the icon. The other sites in your screen shot are graduated sites. Recently it has become possible for a site to graduate without yet having its new design, so you'll see some blue-and-white logos that aren't beta sites while their designs are produced. So not all sites using that scheme are beta sites, but all beta sites use that scheme. Who can change them ? There is no mechanism for community moderators (volunteers) or community managers (staff) to change the site icon routinely or on-the-fly, in the way that users might change the display picture in their profile. In fact, it's not typical for site icons to be changed at all, outside of the normal graduation process that Monica described. That said, there is precedent for staff changing a site's icon by special request from the community, as when the Aviation and Astronomy beta sites were found to have the same default icon. Changing the icon is not out of the question, but I'd need to see more consensus and discussion about what to change it to (if anything other than Eng). Site icons do represent some part of a community's identity, but only a very small part, and changing them with any frequency would probably be a negative in terms of representing that identity in a consistent way. Not the answer you're looking for? Browse other questions tagged discussion design logo graduating-sites icons . How can we change the favicon of SE site in Beta?